Fujitsu fi-6750S Scanner The fi-6750S is a simplex ADF entry model scanner that is intended to meet the needs of the cost conscious end-user. It is ideal for cost sensitive companies and offices that primarily scan one sided documents. In addition to enhancing the variation of the fi Series line-up with its cost-performance effectiveness, the fi-6750S' virtual duplex ADF scanning function enables it to duplicate duplex scanning while scanning one side at a time. The fi-6750S' ability to continuously scan up to 200 sheet of different weights, quality and sizes at 72ppm (A4, Landscape, 200dpi) enables it to efficiently digitize large volumes of paper documents. On top of this, the fi-6750S is able to scan paper that is up to 3m long, which enables it to digitize electrocardiograms, instrumental data readings and other long documents. Speedy and flatbed equipped scanner. 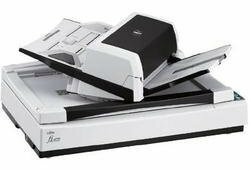 The fi-6750S is loaded with 2 high end fi-Series functions that enable it to efficiently scan mixed batch documents containing paper of different weights, quality and sizes. Loaded with "intelligent" functions for efficient operation. Comes bundled with ScandAll PRO image capture software. The intelligent multifeed function simplifies pre-scanning preparation and improves efficiency. Powerful production scanning solutions in one box.